There is a research about stock saying that those who lost less in the market are the ones who are self-discipline. That is, they have a profit target and stoploss point. When the price rises above that target they sell decisively; when the price gets down below that point they also decisively abandon. One of Chinese wisdom is "square outside while circle inside" when doing things, which means you should set up a principle first, within that principle you are free to do anything. Thus, you should have some rules to have a healthy life. Let's start from today. For instance, exercise at least one hour each day, 6 days for a week. Leave one day to be a lazy guy. Cooking at least three days a week to eat healthy food. Bonus yourself a meal for chocolate cake, chocolate or other cookies and dessert in a month while only have a bite size once a week if you want to eat. When you setup some rules and abide by it, you'll become used to it. That's the way to form a good habit. Sometimes it may be caused by cold evil when you feel pain in stomach, muscles, joints, etc.. The world is really flat. While Jeremy Lin became the superstar in the USA he also became hot in China at the same time. A wave of Lin food and drinks is blowing in New York, such as linitis, Lin soup, Lin snack bar, Lin Shake, etc. But all these are not on his daily must-eat menu list. Then what's his diet menu? Bean sprouts contain Qi of ascending and generating, matching spring Qi. It's the best time to eat bean sprouts in spring. Healthy lifestyle and right diet can prevent cold and flu. In the past, cold disease always happened in winter. But today because of the air-conditioners it happens in all seasons. Besides these, drench, walking in water and exposure to wind in sweating may also cause cold disease. When you eat cold/raw food or drink cold/iced beverage you are easy to be attacked by cold diseases, especially in cold environment. Cold is Yin evil, so it hurts Yang Qi, tends to coagulate and contract. When Yang Qi is impaired, it cannot warm and transform Qi. Many cold syndromes are caused by cold evil such as cold-pain in stomach and abdomen, vomiting, diarrhea, aversion to cold, cold hands and feet, profuse and clear urine, etc. When cold evil attacks superficies it'll lead to aversion to cold, light fever, headache and body pain; when cold evil invades stomach it blocks digestion and the transformation of food, and the stomach feels full or pain; when cold evil attacks muscles and joints it'll cause pain in muscles and joints; when cold invades the limbs and joints, the tendons and vessels will become contracted, bring on stomach pain , headache and spasm of the limbs. Beside the above, he must drink 8 bottles of water and eat 8 bags of vegetables. This is typical low-carb diet. However, he consumes enough vegetables which contain carbohydrate. Bean sprouts contain more nutrition than that of beans themselves. Dry beans don't contain vitamin C but sprouts do. Meanwhile nutrients in sprouts are easy to be absorbed than that of beans. TCM holds that bean sprouts contain Qi of ascending and generating, matching spring Qi. It's the best time to eat bean sprouts in spring. b. 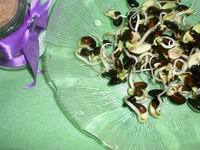 You can grow bean sprout at home. Here is the details. c. Many bean sprout recipes: stir fry, noodle soup,etc. d. Soybean and soybean products help to beautify our skin. Mung Bean and Black Bean help to remove toxin stored in our body in winter. So we can go for a bean sprout diet for skin by using these three kinds of bean sprout. Here is the skin diet menu. It's the burst season of cold and flu in Spring. By having a good lifestyle and right diet we can prevent or kill them at very early age. Everything is reviving and generating in spring. We should disperse toxic heat stored inside our body. Go to the suburb or go for some sport activities to sweat toxin out. Don't eat greasy, heavy flavor food. Eat fresh leafy vegetables, bean sprout and light flavor foods. These food help you promote Yang QI and generate healthy Qi. In case you are attacked by cold or cold-wind. Try all the ways to sweat the cold out at the beginning. At that moment it just attacks your skin surface. Otherwise the cold-wind will go into your internal organs, attacking your lung, your stomach or spleen, etc. It will be very hard to get it out then. And it may cause very serious fever. Some recipes for removing cold-wind. a. Ginger and Brown Sugar Tea. 2 or 3 ginger flakes, 2 tablespoon brown sugar. Place the above two material in a boiling water, boil for 10mins. Drink one or two cups hot tea till perspiration. When it almost done add in ginger strips, radish strips and scallion white strips. Continue to cook additional 15mins. Serve with warm till perspiration. Please note, when you began to perspire hide yourself in a quilt and have a good rest. Don't expose you to the wind and the cold.